Your average tea sachet or cup of loose tea is going to hold around 3-5 grams of tea, steeped in 350 mL of water. For your tea tasting, measure out double the amount of tea you would normally sip, or just use half the water – 175 mL. We’ll explain why in the next section. Heat your water. Here, you’ll want to be very careful about what temperature your water reaches. White and green teas: these delicate leaves can’t handle too much heat, or else they end up singed with a bitter, burnt flavor. Steep at temperatures between 170 and 185 degrees Fahrenheit. Oolong teas: add a little more heat! Brew at temperatures between 180 and 190 degrees Fahrenheit. Black and herbal teas: Heartier leaves can handle a full boil. Steep at a temperature between 208 and 212 degrees to release the full flavor. Start steeping! Pour your water over the leaves and cover the top of your mug or teapot to preserve the heat. Set a timer for 4-5 minutes (a full-fledged, long steep), and remove the tea after the timer has gone off. Spit: Now your tea tasting just got really rude! Spitting out your tea like you would at a wine tasting is purely optional, but many tea tasters spit out their tea so that they don’t become overly “jived” from caffeine. Wondering if you need to cleanse your palette when you’re tasting multiple teas? You actually don’t. Tea tasters transition from tea to tea without pause to quickly compare flavors. Don’t worry—the flavor of the previous tea won’t “dilute” what’s in your mouth now. Now comes the hard part: taking what you’ve tasted and putting it into words. The disclaimer for this step is that it is purely subjective – there is no “right” answer. What you taste is what you taste, and any adjective you’d like to use to describe your tea is just fine. 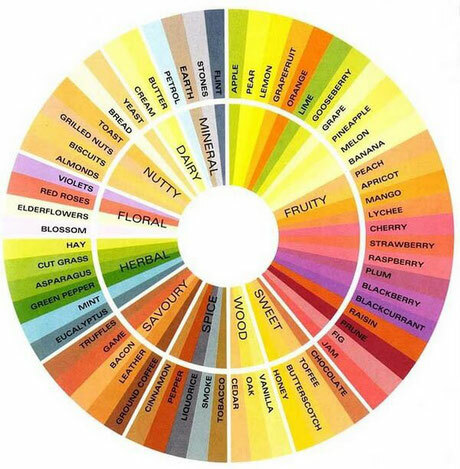 As you can see, this flavor wheel has some great suggestive terms that you can use to describe your tea. However, if you’re still in search of things to say, let’s get even more detailed by looking at types of tea, and putting them into the flavor categories (wood, sweet, fruity, etc.) that they generally fall under. 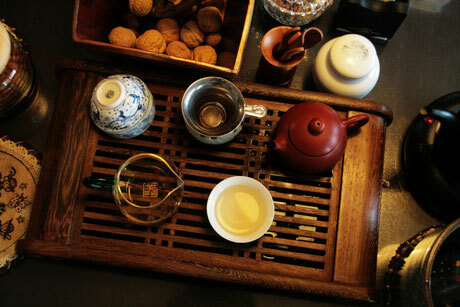 The earthy, deep tones of many black teas will often fall under the Wood and Mineral categories of the flavor wheel. Green teas taste…green. 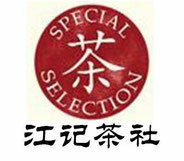 The vegetal tasting profile of green tea means that it generally falls under the Herbal section of the flavor spectrum. Oolong’s flavor can be smoky and/or sweet, green and/or black. It often occupies a middle ground in the realm of tea between green and black teas, and so its flavor profile can run the gamut of Spice, Sweet, Wood, and Mineral. 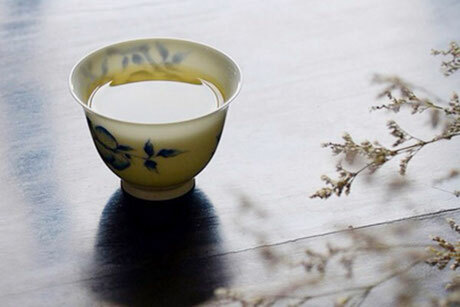 Incredibly subtle in their flavor, white teas are light, bright, and often have a little sweetness. You’ll often find pleasant Floral aspects in white tea, along with flavors in the Sweet realm of the spectrum. Your first tea tasting might not be perfect. The right words may not suddenly arise to the tip of your tongue after first-slurp. But keep on trying! Experience makes all the difference. As you refine your palette, and teach your brain to describe what it’s tasting, the right words will become increasingly more accessible. And most importantly, all the while you’ll be developing an increasing appreciation for the tea you’re tasting, and will be able to truly differentiate between your average, run-of-the-mill cuppa’ and some of the greatest teas on earth.